Explore confidently knowing you have the best bear spray on the market with you—Frontiersman Bear Spray. 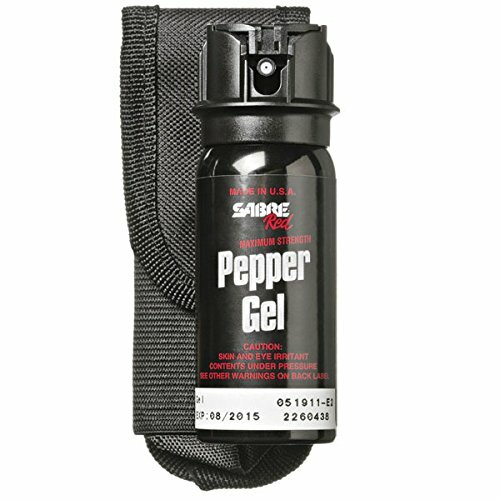 With the maximum strength pepper spray formula allowable, you will deploy a cloud of pepper spray with 2.0% major capsaicinoids strength – more than a third more potent than our industry leading SABRE Pepper Spray which is used by more police forces and consumers than any other in the world. With a range of up 30 feet (9m), Frontiersman Bear Spray delivers 45 grams of spray per second, creating a barrier to fully encompass the attacking bear.Frontiersman Bear Spray is dependable and long lasting, maintaining its strength and potency with a 3-year shelf life from date of manufacture – each can is labeled with manufacturing date so you are confident before hitting the trail.The easy to use canister also features a glow-in-the-dark safety clip in the event you need to locate your spray in low light.Frontiersman Bear Spray – when only the best will do! Bears are most volatile when they are startled or surprised. The Frontiersman Bear Horn helps you alert the animals—causing them to move out of the area. A quick burst of the 115dB horn will warn animals up to half a mile away that humans are around. Bears tend to move away from the noise and give you a safer path for continuing your hike or trail ride. 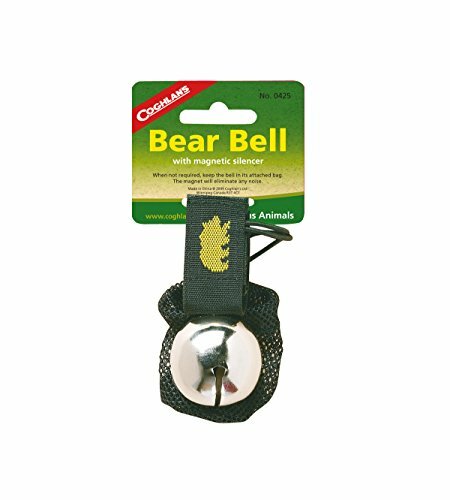 Louder and more distracting than bear bells, wildlife in the area will seek to avoid the intrusion and thereby make you less likely to startle them into aggressive and dangerous behavior. The horn is also an effective tool should you become lost or injured, giving you the ability to attract the attention of fellow hikers and campers, and get the help you need. Each horn is compact and easy to carry and can be sounded up to 50 times with a ¼ second blast, or up to 25 ½ second blasts. 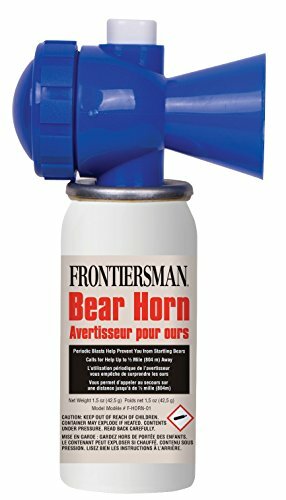 Be safe and carry a Frontiersman Bear Horn whenever you are hiking, biking, or camping in bear country! Includes one Guard Alaska 9 oz. bear spray canister & one tactical metal belt clip holster. Perfect for outdoor nature enthusiasts, survivalists, hikers, hunters, campers, and country dwellers to protect from bear attacks. 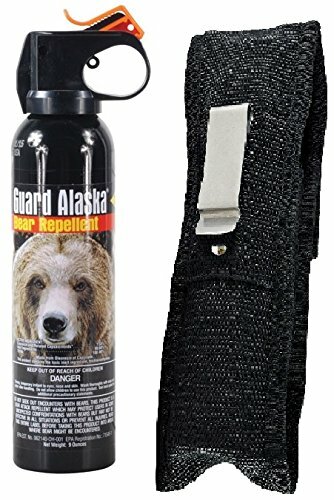 Guard Alaska Bear Spray has proven to be so effective at repelling bears it is the only bear spray registered with the EPA as being effective on ALL bears. Safe for the environment as it does not contain flammable or ozone deleting substances. Explore confidently knowing you have the best bear spray on the market with you—Frontiersman Bear Attack Deterrent Spray. 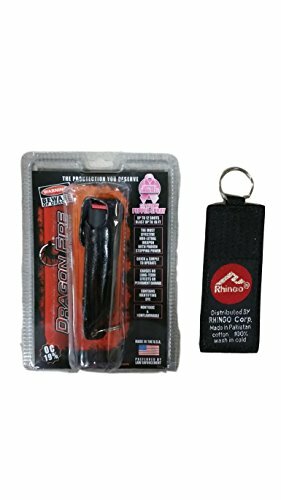 With the maximum strength pepper spray formula allowable, you will deploy a cloud of pepper spray with 2.0% major capsaicinoids strength – more than a third more potent than our industry leading SABRE Pepper Spray which is used by more police forces and consumers than any other in the world. With a range of up 35 feet, Frontiersman Bear Spray delivers an industry max 52 grams of spray per second, creating the biggest barrier of any bear deterrent spray for maximum safety. 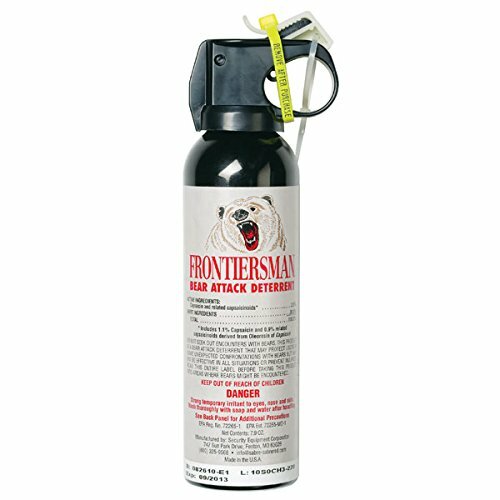 Frontiersman Bear Spray is dependable and long lasting, maintaining its strength and potency with a 3-year shelf life from date of manufacture – each can is labeled with manufacturing date so you are confident before hitting the trail. 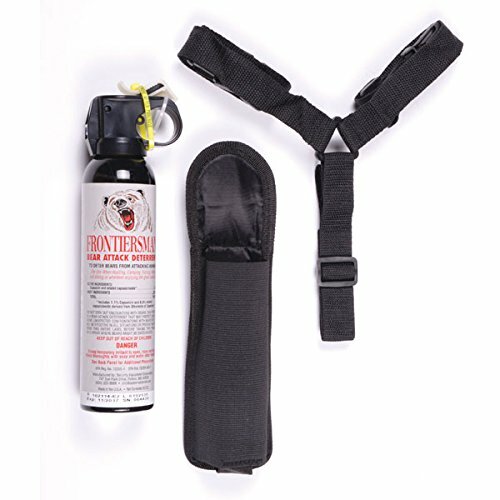 Frontiersman Bear Spray with Chest Holster system includes a 9.2-ounce canister of quick-to-deploy deterrent spray with a holster worn in easy reach. Built for fast deployment in the event of a charge, the holster allows immediate access. The easy to use canister also features a glow-in-the-dark safety clip in the event you need to locate your spray in low light. Frontiersman Bear Spray – when only the best will do! Exceeds all bear biologist and wildlife specialist recommendations. Proven effective by National Park and Forest Service and University of Montana. Added features are non-freezing formula, glow-in-the-dark safety wedge and special tie attachment to prevent loss of safety wedge. 10.2 ounce Counter Assault Bear Deterrent. Spray distance - 32 feet. Spray duration - 9.2 seconds. Model: CA-18H/SB. 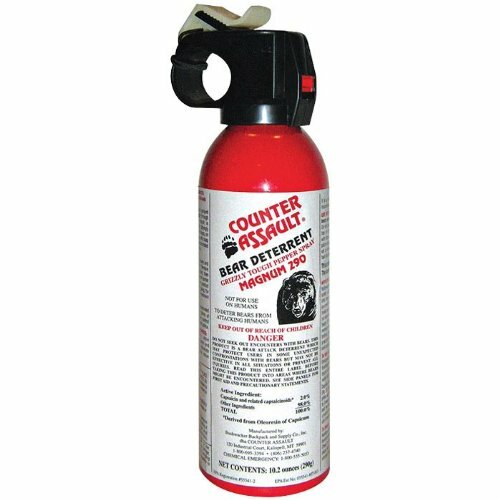 Looking for more Bear Repellent Spray similar ideas? Try to explore these searches: Team Carbon Riser, Wind System, and Callaway Golf Gems. This video is of a Yellowstone Park Ranger using bear spray on a mother bear with two cubs.